Out Shooting Film is a new series of T-shirts aimed at film photographers, inspired by the everyday interactions our love of analog inspires. Each month a new shirt will feature a film-related phrase and/or image film lovers will be all-too-familiar with. Out Shooting Film 12-2016 light grey T-shirt. The December 2016 shirt features a phrase film adherents hear uttered over and over when their vintage gear is revealed to shoot film: “Do they still make film for that?” A stylized TLR camera rounds out the design for the inaugural shirt. These high-quality American Apparel crew-neck, short-sleeve T-shirts are available in black, maroon, navy, olive, and two shades of grey. I can’t guarantee the light grey is 18-percent, but it’s close! Sizes available range from XS all the way up to 3X. 100% cotton. The straight dirt: I chose Teespring and American Apparel for these because I’ve got several of them in my closet. I find the American Apparel shirts exceptionally soft, and the seams are almost impossible to feel anywhere. I find they run just a tiny bit on the smaller side of average for each given size, but just a little. I wash warm and dry on medium heat, and mine have shrunk only a very small amount. They still fit great, and I love the feel. This campaign runs until 11 p.m. Eastern, Dec. 1. If demand exceeds my expectations, I’ll extend the campaign until everyone is satisfied! » View colors and sizes — and order yours! 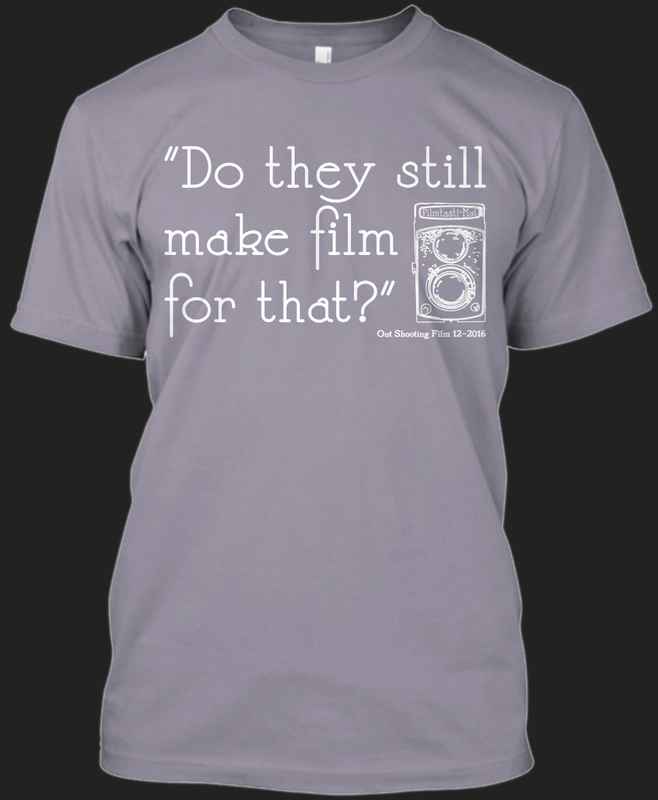 I’d be lying if I said I wasn’t hoping to make enough money to buy a little film by offering these shirts, but I’ve tried to price them very reasonably. I’d have to sell many hundreds of shirts to buy a Rolleiflex (get on that!). Out Shooting Film shirts are just $19.99 plus shipping. If this design looks vaguely familiar, it should — it’s adapted from a square on my Film Photography Bingo card. I’m not going to beat around the bush — help me out and buy a shirt. Or wait until next month when I put up something new. Above all, please comment below with your feedback so I can improve the series moving forward. Special thanks to Dev Samaddar for supplying a pivotal idea that led here, and to EMULSIVE for lettering me bounce ideas. » Get your December 2016 shirt on Teespring.com today! Game time: Play Film Photography “Stranger Danger” Bingo!